June, 2016. Another mass shooting, another massacre, this time in Orlando, and the ritualistic hand-wringing begins again. What can we do to stop deranged loners from shooting up schools, malls, clubs? One of the most insane “solutions” is the idea of arming everyone, so that all the “good guys” can mow down the bad guy. Except that, first off, it’s not always easy to pinpoint the bad guy in a room full of people with guns, and secondly, if everyone is armed and shooting, plenty of good guys could end up dead as well. Another solution: upgrade the resources of our law enforcement agencies, so as to preempt all the bad guys in advance. Impossible. There’s no way our police and F.B.I. will become efficient enough to forestall the potential perpetrators. There are just too many potential perps. The only real solution is the one so many Americans still don’t want to hear: gun control. Is there any other country on earth where it’s as easy as it is here to buy guns? Is there any other country who allows the insane practice of selling people assault rifles? 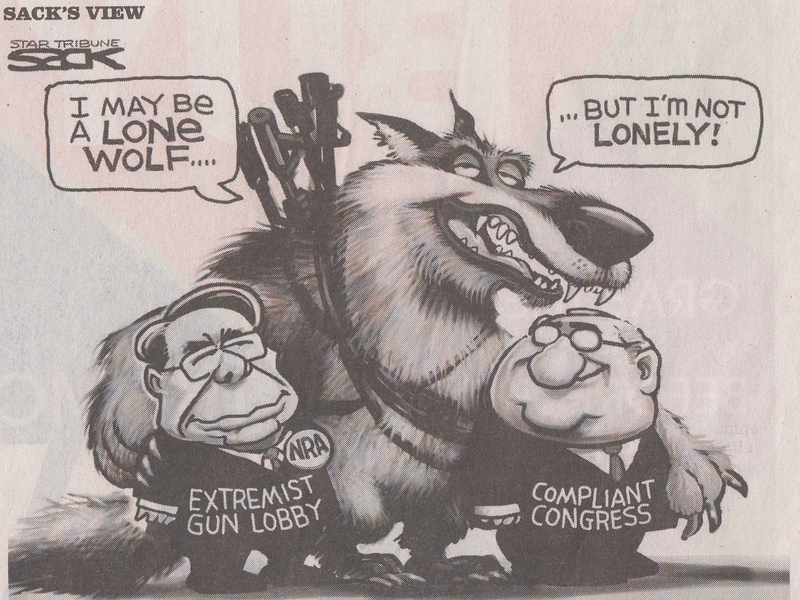 The BIG GUN lobbies are stonewallers. They will not agree to even the most logical of propositions: to stop insane people or terrorists from purchasing weapons (assault rifles) made solely for the purpose of killing people. We need to find ways to circumvent BIG GUN. We can’t stop the killing if we refuse to take even the first step in gun control. That first step would be to ban all sales of assault rifles in the U.S.
Would the deranged loners be able to get ahold of an assault rifle illegally? Possibly, but it would be much more difficult than it is now. Would the deranged loners still kill people, say, with a knife or an axe. Possibly, but they would not be able to kill as many.